Become a digital service partner for your customers in the networked age. Give them access to all machine data and smart digital services relating to your machines. Location-independent and worldwide. 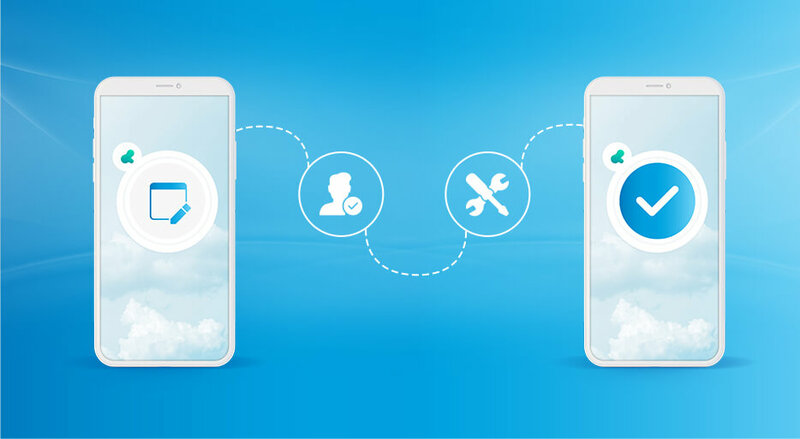 With SCS connect, the digital service app for your customers. 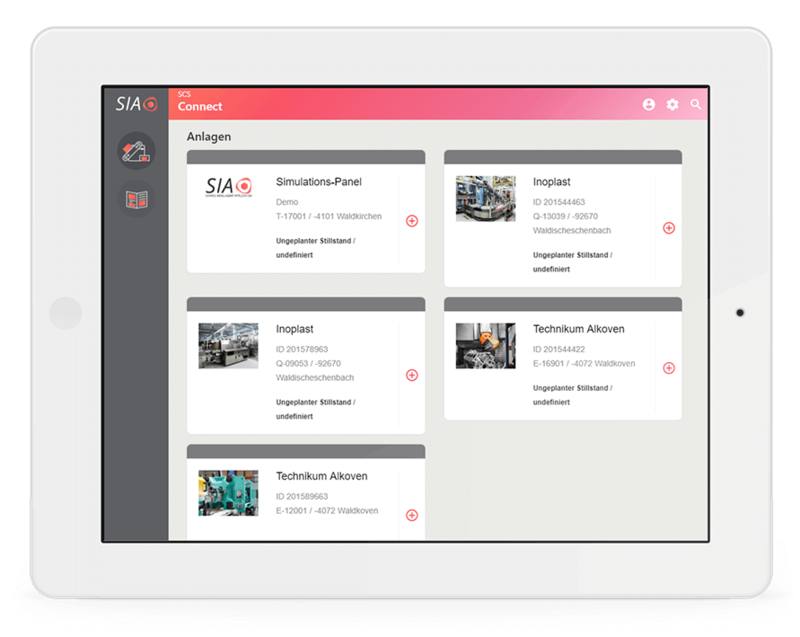 Individual white label app for your customers that integrates your installations in your customers’ business processes. Key figures, dashboards, and services for all machines. Independent of location and globally available. Optimal support for machine operators by means of up-to-date BOMs, maintenance instructions, and videos. The Information Center for Your Customers. 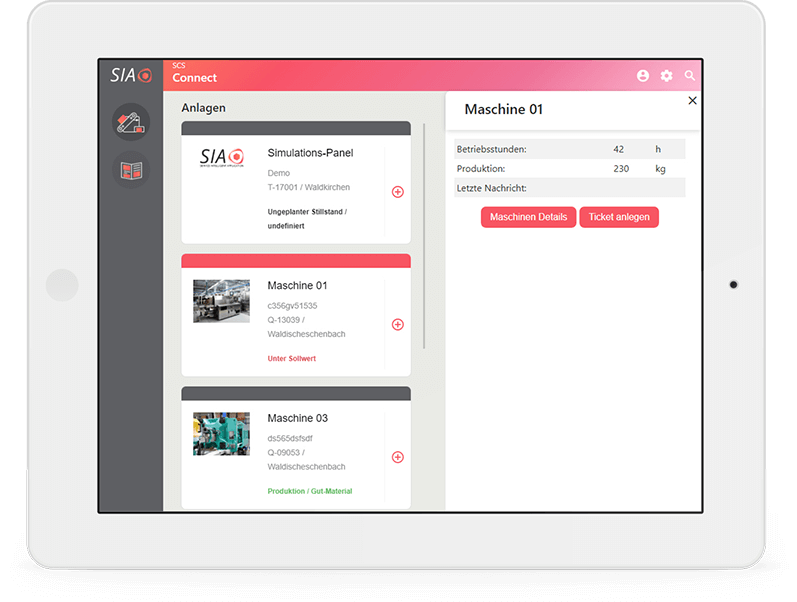 With SCS connect, your customers keep an overview of the performance and efficiency of their machine park. 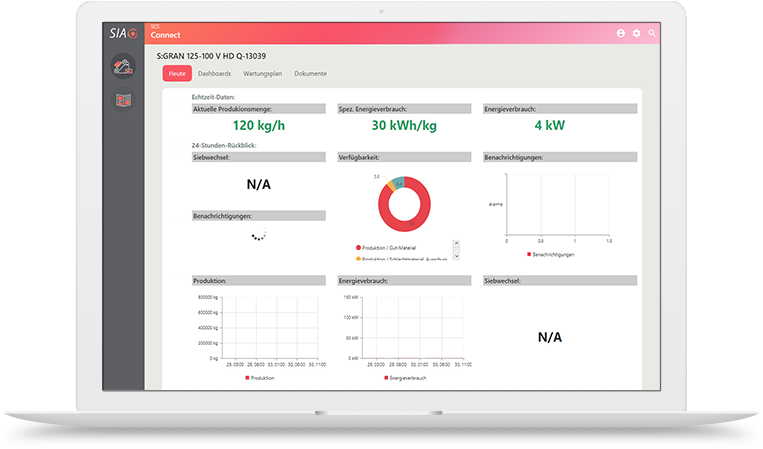 Intuitive dashboards show you all important KPIs at a glance, and indicate where there are potentials for optimization. 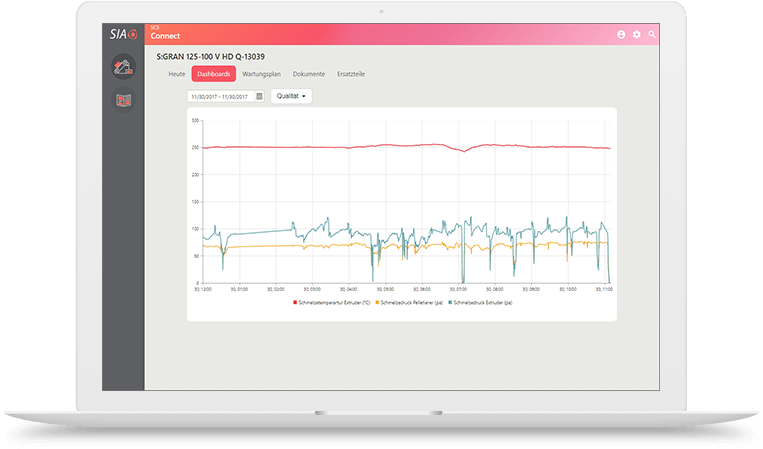 In doing so, SCS connect also refers to the machine operating data that is provided by SCS analytics: if measurement data falls below the permitted values, your customers are automatically warned and recommended to perform a corresponding maintenance service. Reduce unplanned downtimes – with the latest predictive maintenance technology. "The values that are measured for the machines act as an early warning system for production: if any malfunctions are apparent, predictive measures can be taken to avoid unplanned failures and downtimes. Your customers can also respond immediately if performance falls below a certain target value. 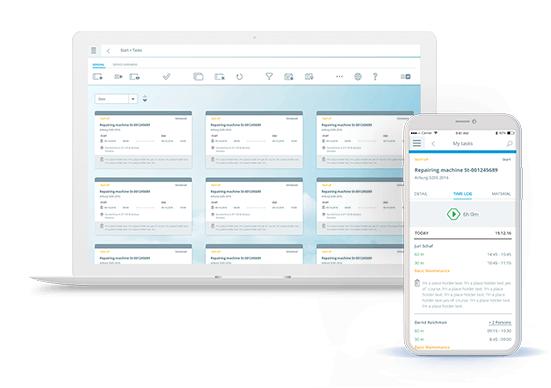 Use the SCS connect app to create a service ticket conveniently in your ERP system at any time. On the basis of this, your planners then use SCS planning to generate a corresponding maintenance operation quickly and easily." Flexible self-service via an app. Simple maintenance work can be carried out on the machine in no time by machine operators or on-site technicians using SCS connect. Up-to-date video instructions and checklists offer support with this. At the same time, SCS connect provides a comprehensive overview of all maintenance activities that are currently pending. Enhance Your Offering with Digital Services. 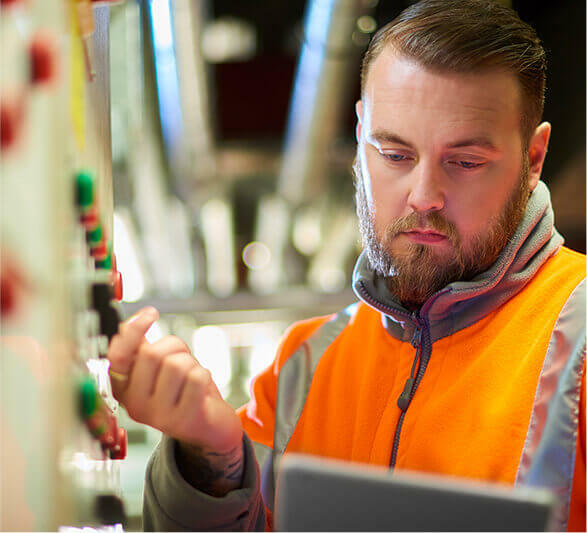 SCS connect significantly facilitates the work of your service technicians and machine operators at the customer's site. The machine overview quickly and conveniently provides all information about the respective installation. The document management system can be used to call up all service-relevant documents for the individual machine types. These can also be supplemented with optional video material. In this way, even complex maintenance processes can be illustrated comprehensively and in step with actual practices. 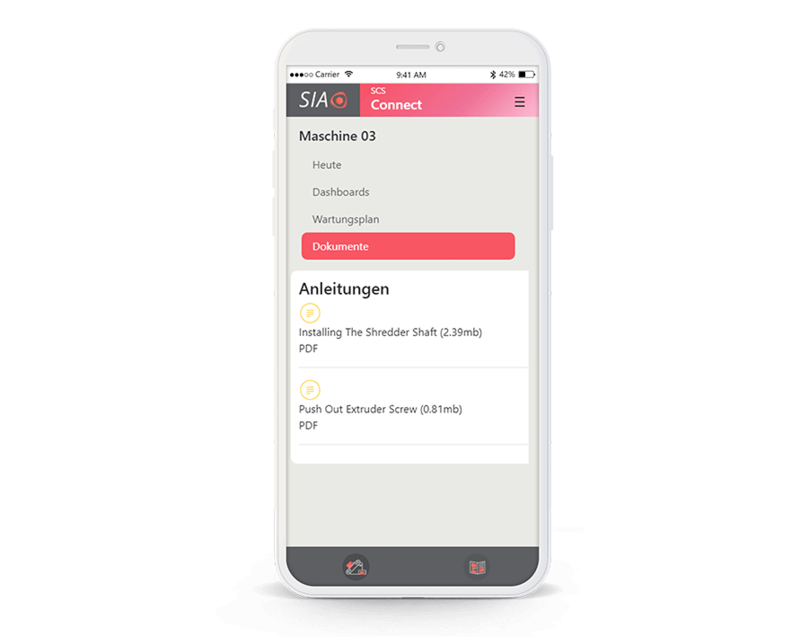 If a machine component is defective, the app enables you to order spare parts quickly. The respective spare parts catalogs for the corresponding installation can be called up immediately in the app. With SCS connect Into the Networked Future.